Home / Issues / 2014: Any Hope for the Unemployed? 2014: Any Hope for the Unemployed? A younger university colleague once called to break his graduation news to me and that he was now like me. I chuckled, hoping he had known where he had graduated into and where he was heading. Call it the spider’s web if you like. I was sure he did not do his homework well about the unemployment situation in Nigeria for if he had, he would have had a deep thought about his next port of call after graduation – the burgeoning labour market where his suffering continues! Come to think of it, it is still unclear to me why there is this apparent negligence for the skilled and qualified graduates in Nigeria. Even the few that are employed are suffering from ‘much work, less pay’ syndrome, a euphemism for underemployment. And when this happens to the skilled graduates, then there is little hope for the unskilled ones. Sometimes a graduate asks himself the essence of being a graduate when there is no single job for him out there. Whenever he sees his secondary school mates who had ventured into business and then today ride in posh cars, he regrets why he didn’t take the same path. Then a job-seeking graduate is even hobbled by employers’ demand for experience, in some cases, of not less than two years. Pray, from where does he get this experience? The point is that those that already have the jobs are still busy looking out for more gainful employment thus giving no room for the inexperienced jobseekers. To worsen the situation, to be employed nowadays is largely on “man know man” basis. You need to have the connection and influence. Again, those who have come of age in the service, public service in particular, do not want to retire to give room for the younger ones much for reasons of self-preservation rather than greed. For this, they keep tampering with their ages and getting younger on paper! Few Nigerians who may not have walked round the streets of major cities in search of jobs with their CV tightly folded under their armpits say the problem of unemployed graduates is that they are unemployable and that there are jobs. If there were jobs, why would a PhD holder want to cheat the BSc holder by applying for a driver’s job in Dangote, for instance? It means there is no job for even a PhD holder not to talk of a BSc or BA graduate. What about the employable ones? What is provided for them? Nothing! Will the 50,000 jobs the federal government claimed to have provided through the Subsidy Reinvestment and Empowerment Programme, SURE-P, be enough for the 300,000 graduates that tertiary institutions churn out every year? We keep shouting every day that there are criminals, kidnappers and prostitutes everywhere, forgetting that when the desirable is not available, the available becomes desirable as criminal activities become attractive. Instead of politicians helping the unemployed in their various constituencies, they prefer using them for their selfish political activities. From available records, as at 2007, according to the National Bureau of Statistics, Nigeria had 5.3 per cent of its labour force unemployed. 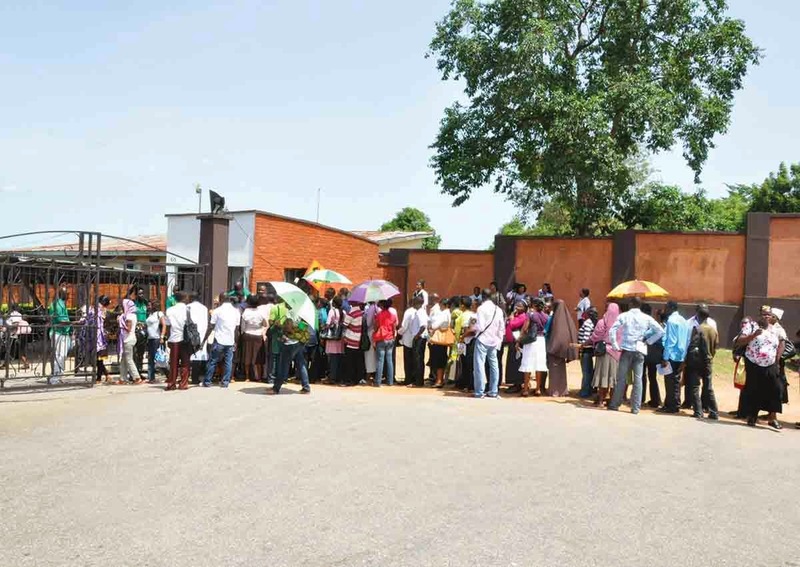 Now the figure has climbed to 24 per cent, indicating that about 40 million Nigerians are unemployed as recently disclosed by the former chairman of SURE-P, Christopher Kolade, during a sensitisation and mobilisation programme organised by the Graduate Internship Scheme, GIS, in Ado-Ekiti, Ekiti State. It means that every year, Nigeria’s unemployment rate increases. How long this situation will continue is anybody’s guess. Today, lots of people are everywhere scamming those looking for jobs. The government is also involved in this fraudulent method of extorting from people in the name of paying for job application forms. At a point, Delta State governor Emmanuel Uduaghan had to halt the collection of N1,500 for application forms from people desirous of working at the Asaba airport. The monies were never refunded. In spite of the governor’s order, the state Civil Service Commission has begun collection of money from applicants for recruitment into the civil service. Several other federal government ministries and agencies do this. In the end, those who laboured to pay these fees still get back to the starting point unemployed whereas the sons and daughters of the “who is who” in the society get employed. Reliable sources from many government ministries indicate that applications made online are nothing but a waste of precious time. In his New Year message, President Jonathan assured of improvement in job creation. Will it ever be achieved? For how long will such promises be made without fulfilment? The nation, government agencies, private companies have to give every employable graduate the reason not to regret being a graduate.